Stationary exercise bikes are a great way to get the cardiovascular exercise we all need. Finding the best stationary exercise bike to meet your individual needs can take a little work, but hopefully this review will help point you in the right direction. Like all home exercise equipment, there are a lot of stationary bikes on the market these days. My goal for this article is to give you the tools to narrow down your search as well as present my favorite upright exercise bikes currently available. By the end of this article, you will know what to look for when comparing different stationary bikes and feel confident in your decision making. Lets get started! What Is A Stationary Exercise Bike? This may sound like a silly question, but for the sake of clarity, I think we should define what a “stationary” exercise bike is. This is a very broad term and technically encompasses several different types of exercise machine. For the sake of this article, when I talk about stationary exercise bikes, I’m really talking about the upright variety. Stationary exercise bikes really include upright bikes, recumbent bikes, and spin cycles. I’m not going to go into too much detail here with regards to the differences between them all, but if you are interested in a more detailed comparison, click here. 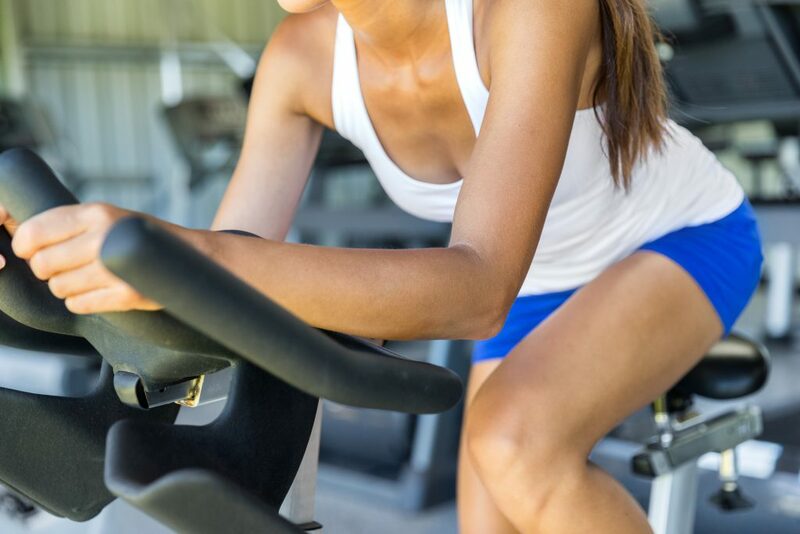 Each type of exercise bike has its benefits. Recumbent bikes are great because they are more comfortable to sit on and they put less stress through your hips and knees. Spin cycles are great because they closely mimic the feel of riding a road bike and they can really provide an intense workout. Upright bikes are a nice combination of the two. They are more comfortable to use than spin cycles, but they still keep you in the traditional biking posture (upright). Upright stationary bikes can provide a great workout too. The good ones offer plenty of workout options and plenty of resistance to get the job done. Fan (or air) bikes are another category of stationary bike I don’t want to neglect. I love fan bikes because they can really provide an intense cardiovascular workout while working your arms and legs at the same time. The Crossfit folks use them a lot…enough said. To me though, they belong in their own category and won’t be included with these upright bikes (look for a comparison of fan bikes to come in the future). One thing all stationary exercise bikes have in common is that they can be a wonderful addition to any home gym. Generally speaking, they offer a low-impact form of cardiovascular exercise that can be done indoors. People that have a hard time using a treadmill or elliptical can still usually find a stationary bike that is comfortable to use. When searching for a stationary exercise bike, it’s a good idea to have a game plan. There are a TON of different exercises bikes out there. It can get a little daunting if you don’t have a blueprint. If you have a predetermined list of want you want, you will know what to look for and compare between models. This will make your job a lot easier. The different workout programs an upright bike offers is a great place to start. Most decent stationary bikes will offer anywhere between 16 – 30 different workouts. More isn’t always better, because often several of them may be very similar to each other. But if you like the idea of having plenty of preprogrammed variety, aim for a bike that offers more workouts (many offer over 20). Most stationary bikes offer similar programs. These include: manual, hills, intervals, random, fat burn, and heart rate (HR). Sometimes you’ll see different cardio programs and custom programs. The machines with 20 and 30 different programs will have multiple programs in each category. Anyone that has read any of my reviews in the past knows I’m a stickler for weight limits. Not only is it important to make sure you are safe to use the bike, but it gives you a good idea of how well the bike is built. Higher weight limits are always preferred. I recommend finding a stationary bike that has a weight capacity of at least 300 lb. It’s going to feel more stable during use and last longer. For some folks, technology might be the most important factor. If so, look for a bike that offers bluetooth connectivity to your favorite apps. Not all bikes do, especially with budget models. If you don’t care so much about fitness tracking, you should also consider monitor size and whether the bike can track heart rate or not. Decent exercise bikes should at least offer a grip heart rate monitor and many will offer telemetry tracking (chest strap). Any bike that offers HR workouts will have the ability to track your HR. Warranty is another great indicator of how well built an exercise bike is. Not all bikes have a warranty! Decent exercise bikes will however and they vary. Many quality bikes will offer lifetime warranties on frame, 3-5 years on parts, and at least 1 year on labor. With so many quality options, there’s really no reason to purchase a bike that doesn’t offer a warranty. There you have it, a good starting off point for comparing different upright bikes to each other. All upright bikes will have similar dimensions, but it’s always a good idea to check that as well to ensure the machine will fit in your space. Coming in at number 1 is the Nautilus U618. The U618 tops my list because it offers a perfect combination of features and price. This bike is produced by one of the most trusted names in exercise equipment. Nautilus has been around for decades and is one the biggest reasons home exercise equipment is what it is today. The Nautilus U618 is great because it’s specs can compare to bikes that literally cost 2x as much. The U618 comes loaded with 29 different workouts. This is a ton of workouts for a moderately priced machine. If you are looking for a bike with plenty of workout variety, the U618 has you covered in that category. It also comes with 25 levels of magnetic resistance which will give you complete control over your workouts. This bike uses a 30 lb flywheel to provide a smooth, even feel during use. Heavier flywheels help give bikes a more natural feel, similar to how riding a bike outside feels. The programmed workouts include fat burn, cardio, HR, and plenty of intervals. There are also customizable programs. The Nautilus U618 has an impressive weight capacity at 325 lb. This is high enough to comfortably accommodate larger users. It’s also high enough to ensure a stable ride without the fear of wobbling at higher resistance levels. The U618 has a large, easy to use monitor with dual blue backlit screens for data tracking. The large buttons and “quick start” option makes getting started a breeze if you are in a hurry. The Nautilus U618 offers bluetooth connectivity to their Nautilus Trainer 2 app. This is a free fitness app that allows you to track all of your fitness data. This bike can also connect and interact with other supported fitness apps. You can also download the RideSocial App for free that allows you to ride in different real world environments. Pretty cool app to play with. This bike does have a grip HR monitor but it also comes with a free chest strap monitor. The chest strap monitor will give you a more accurate reading and make it easier to monitor your HR as you workout. Nautilus offers a 15-year frame, 3-year parts, and 1-year labor warranty for this bike. Pretty solid warranty considering the price. Overall, the Nautilus U618 Upright Bike offers a lot of features and is well priced. It comes with a great weight capacity and a solid warranty to back it up. This bike is currently boasting an average user rating of 4.6/5 on Amazon. The only negative aspect users mention is an occasional noise from the crank when pedaling at higher speeds. Next on the list is the 3G Cardio Elite Upright Bike. This bike made the list because it is a beast- it has an incredible weight capacity (at 350 lb) and a great warranty that ensures it will hold up for the long run. For those of you unfamiliar with the 3G Cardio brand, you should look them up. The name isn’t as recognizable as Nautilus, but they are producing some top notch home fitness equipment with multiple “best of” rewards in various categories. I first became aware of this company when I reviewed a 3G Cardio treadmill. I was impressed to say the least. The company’s mission is to produce high quality fitness machines without all the “bells and whistles” so that they can keep their prices low. The 3G Cardio Elite comes with 16 different workout programs. This includes 12 preprogrammed workouts (cardio, fat burn, etc), 3 different HR programs, and 1 power workout (watt based). The 3G Cardio Elite doesn’t offer quite as much workout variety as the Nautilus mentioned above, but with 16 different workouts, most users should be satisfied. Speaking of users, this bike also saves profiles for up to 4 different users. This makes it easier to switch between users and gets your started on your workout faster, as well as keeping data tracking more accurate. I mentioned already that the 3G Cardio Elite has a whopping 350 lb weight limit. This is impressive at any price point and can stand against most commercial exercise bikes. This bike beats out the Nautilus U618 by 25 lb in this category. I mentioned briefly above that 3G Cardio is all about producing high quality equipment without all the “bells and whistles”. Well, in this case, this means minimal technology. The 3G Cardio Elite bike doesn’t have any bluetooth capabilities, so if you are looking for a bike that can connect with your fitness apps, this isn’t the right bike for you. What this bike does have, is an easy to use monitor. The dial system makes it easy to make your selections and the digital display is easy to read. The 3G Cardio Elite comes with a grip HR sensor and a free chest-strap HR monitor. I love it when companies throw in a chest strap, just a nice little touch. 3G Cardio offers a great warranty on this bike: lifetime frame, 7-year parts, 1-year in home labor. This bike also comes with a commercial warranty of 3-year parts and 1-year labor. The fact that this machine has a commercial warranty shows us how well built and durable it is. Durability always ranks high on my wish list and it’s hard to find a more durable bike in this price range. Overall, the 3G Cardio Elite Upright Bike is really a commercial grade bike designed for home use. It’s lacking in the features and technology departments, but if you are looking for a durable bike that will last for years, this is a safe bet. It’s currently rocking a 5/5 average user rating on Amazon. This bike is priced a little higher than the Nautilus U618, but with the higher price you are getting a more durable product and better warranty. The Schwinn 170 Upright Bike comes in at number 3 on our list. Schwinn basically invented the exercise bike and has been a leader in producing fitness products for decades. It’s a name synonymous with quality and the 170 Upright Bike fits the mold. The Schwinn 170 is significantly cheaper than the 3G Cardio Elite (roughly half the price) and packs in a lot more programs and technology. The 170 Upright Bike comes loaded with 29 different workouts. These consist of 12 profile workouts, 9 HR workouts, 4 custom, 1 fitness test, and 1 quick start (you just hit the button and start riding). This line up is very similar to the Nautilus U618’s and is great for folks that like having a lot of preprogrammed workout options. The Schwinn 170 also offers 25 different levels of resistance. The more resistance levels you have, the more control you have over your workout. 25 is a large number that will allow you to fine tune the resistance as much as you like. This bike also offers saved user settings for up to 4 different users. This upright bike has a max user capacity of 300 lb. This value is respectable, especially for a bike in this price range, but you can see this is what really sets the 3G Cardio Elite apart. If the Schwinn 170 had a higher weight capacity (and the price stayed the same), it may have made it to the number 1 spot on this list. But, no product is perfect. The Schwinn 170 is loaded up with a lot more tech than the Cardio 3G. This bike does offer bluetooth connectivity to transfer data to the Schwinn Trainer app, as well as all the other popular fitness apps out there (MyFitnessPal, Apple Health, GoogleFit, etc). Like the Nautilus U618, this bike also pairs up with the RideSocial app to give you the feel of riding on different paths in the real world. This upright bike has a dual screen display that makes it easier to show more workout metrics at once. It also has a media shelf for storing your smart devices as well as a charging USB port that can charge your phone or tablet while you workout. The Schwinn 170 comes with a grip HR monitor, but no chest strap. You would have to buy one separately if you so desired. Schwinn does offer a warranty on this bike: 10-year frame, 2-year mechanical, 1-year electrical, and 90-day labor. This is a great example of how price affects warranty. This is roughly half the warranty offered by 3G Cardio and significantly less than the one offered on the Nautilus U618. This is one way Schwinn can offer this bike at such a low price. They cut the warranty. Overall, the Schwinn 170 Upright Bike has a lot to offer at a very affordable price. The biggest setbacks are it’s lower weight capacity and it’s shorter warranty. This bike offers a ton of workout programs and additional features that will definitely increase user enjoyment. And at this price, it’s tough to beat. The Schwinn 170 is currently sporting a 4.4/5 average user rating on Amazon. See full review. The Life Fitness C1 Upright Bike makes it to number 4 on our list. The “Life Fitness” name should look familiar to you if you have ever worked out in a commercial gym. They are a huge producer of commercial grade fitness machines and odds are, if you rode the stationary bikes at your local gym, you probably rode one of their products. Life Fitness also produces home gym equipment. Their C1 Upright Bike is the home version of their popular commercial grade bikes. It has the feel of a commercial bike, which is great. Unfortunately, it also has the price that comes with it. The Life Fitness C1 Upright Bike comes loaded with 16 different workouts. These include one button access to custom workouts, HIIT workouts, and goal based options (HR, time, distance, etc). You will notice this bike offers significantly less workout options than the cheaper Schwinn and Nautilus models above. This is pretty common, the more commercial grade machines tend to offer fewer workouts (quality over quantity perhaps?). The C1 offers 20 different levels of resistance to help you control your workout intensity throughout your ride. This bike also allows for the saving of 4 different user profiles. Note: I’m talking about the model that comes with the “Track Connect Console”. There is also the option of buying this bike with the “Go” console that only has 12 workouts. The “Go” console cannot connect via bluetooth either (but is ~$500 cheaper, fyi). The Life Fitness C1 only has a weight capacity of 300 lb. This is a little disappointing to me. For the price, I would expect at least 350 lb. This bike is designed to resemble and feel like their commercial models, but obviously isn’t as robust. Their club bikes can handle 400 lb. The Track Connect Console allows the C1 to connect to all the popular fitness apps via bluetooth. The Go console does not. The model I am referring to here includes the Track Connect option. With this console, you also get an “entertainment zone”- the top of the console is designed to hold your smart phone or tablet for viewing during your workout. A nice touch because your phone won’t be in the way of operating the controls or seeing your stats. This bike is lacking speakers and a cooling fan. Sorry, if you want to jam out and stay cool while you ride, you should consider another bike. The C1 comes with both a grip heart rate monitor and a chest strap monitor. Life Fitness supports the C1 with a lifetime frame, 3-year parts, and 1-year labor warranty. This is a pretty solid warranty, but this is an expensive exercise bike. I’d like to see a longer warranty on parts. The 3G Cardio Elite has a parts warranty that’s over double that…just saying. If you are looking for a bike that feels like the bike you use at the gym, the Life Fitness C1 Upright Bike is a good choice. It looks and feels like a gym exercise bike. That said, it’s lacking in the weight capacity, warranty, and features departments and is by far the most expensive bike on this list. Personally, I see no reason to choose this bike over the 3G Cardio Elite, but Life Fitness is a great company. Rounding out our list at number 5 is the Nautilus U614 Upright Bike. This is the little brother of the U618 discussed earlier. It has fewer options, less technology, and a lower weight capacity. But it also has a significantly lower price tag! If you are looking for a great bike but are on a tight budget, the Nautilus U614 might be the right fit. The Nautilus U614 comes loaded with 22 different workout programs. These include: 9 profile workouts, 8 HR, 2 custom, 2 fitness tests, and a quick start option. 22 is an impressive number, the U618 only has a few more at 29. This bike should offer plenty of variety to keep your workouts interesting and entertaining though. This bike comes with 20 levels of adjustable resistance. Again, a few less than the U618 (25), but still very respectable. It also allows 2 different users to save their profiles for more accurate data tracking. The Nautilus U614 has a 300 lb max weight limit. Considering the price of this bike, I think this is remarkable. Many bikes in this price range have weight limits in the 225-250 lb range. The Nautilus U614 is a little lacking in the tech department, but surprisingly does offer more than some of the more expensive models mentioned above. The U614 does not have bluetooth capabilities, so you can’t connect with any fitness tracking apps. But it does have a media shelf and built-in speakers with an mp3 input for listening to your music. It also has a dual track display screen for showing more fitness metrics at once. The console is easy to use and the display is large and easy to see. Nautilus gives us a very respectable warranty on this bike, considering how affordable it is: 10-year frame, 2-year parts, 1-year electronics, 90-day labor. This far exceeds a lot of exercise bikes in this price range and matches the more expensive Schwinn 170 above. Well done Nautilus! Overall, the Nautilus U614 is a steal at roughly $250. It offers a ton of workout programs, some tech, a good weight capacity, and a respectable warranty. This is the most affordable option on the list, but it can stand up with the significantly more expensive models. The biggest complaint users have about this bike is that the seat is uncomfortable (Nautilus fixed this with the upgraded gel seat on the U618). That said, users are overwhelmingly happy with the U614. This bike is boasting an average user rating of 4/5 on Amazon. I hope this article helped give you an idea of what you should compare when looking for the best stationary exercise bikes. In summary, I suggest you always look at how many workouts programs are offered, the weight capacity, the tech features, and the warranty for each bike you are considering. I also presented by 5 top picks for stationary exercise bikes this year. All of these bikes have their pros and cons. I chose the Nautilus U618 as my number 1 pick because I feel it offers the most for the price. The Nautilus U614 is a great budget option. If you want the most durable, dependable bike on the list, than you have to go for the 3G Cardio Elite. 3G Cardio makes great products that are built to last. I love their long warranties- a great sign of a quality product. If you aren’t aware, you should know that Nautilus owns the Schwinn brand. That’s why there tend to be a lot of similarities between Nautilus and Schwinn bikes. They are usually pretty comparable. The warranties do vary though, so I would pay special attention to them. I hope this article helps you in your search. If you have any questions or comments, feel free to leave them below and I’ll get back to ya soon.